The fifteen year eight month career of D5117/24117 was spent allocated only to Scottish Region depots. Built BR Derby Locomotive Works (batch D5114 - D5150). Time between last Classified repair and withdrawal: 7 months. Time between withdrawal & scrapping: 10 months. November 1960 to Eastfield (65A). 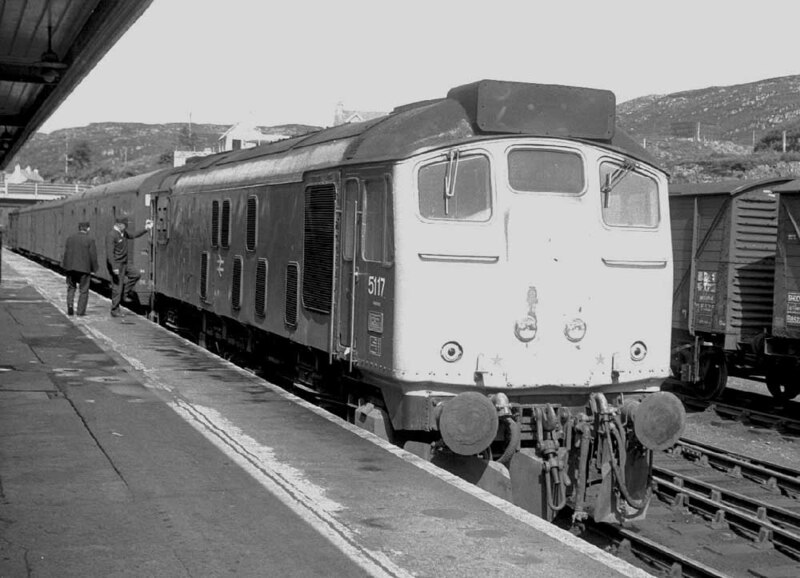 June 1961 to Inverness (60A). January 9th 1976 to store (unserviceable). After withdrawal 24117 was moved to Glasgow Works, at least by April 3rd 1976 until May 2nd 1976 when it was moved to Doncaster Works and broken up by January 1977. Movement: 24015/16/71, 24117 Glasgow Works – Doncaster May 3rd 1976, (behind 26046 at Berwick). 24117 at Doncaster Works during July 1976, showing the collision damage which brought about its demise. Noted Glasgow Works May & June 1975. Condition new: green livery with frame level stripe, tablet catcher recess, full size water tank, shortened fuel tank, hand/footsteps present, cantrail water filler present, three-rung bogie mounted footsteps, ridge sided sandboxes. Delivery to the Scottish Region was via the Midland route to Carlisle over the S&C, D5117 & D5118 were noted laying over at Hellifield shed. 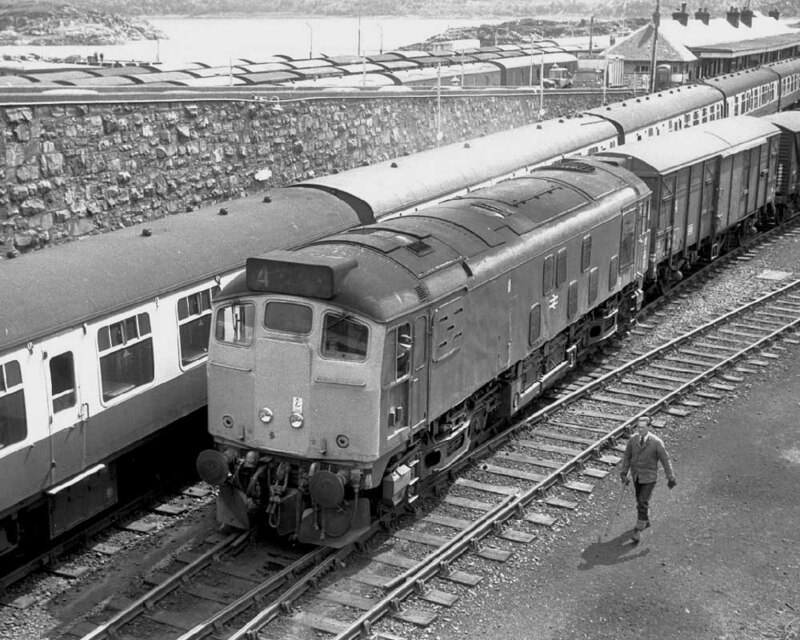 Between November 1960 & June 1961 D5117 was allocated to Eastfield. November found Inverness based D5117 consistently working the 8.12am Glasgow Queen Street - Larbert and 12.52pm ex Polmont return working, later working the 5.35pm Queen St – Waverley slow. Condition July: green livery with small yellow warning panels, curved upper corners, warning panel partially covers frame level stripe; gangway doors fitted with substantial weatherstripping, full size water tank, shortened fuel tank, tablet catcher equipped, blanking plate fitted (five slats), hand/footsteps present, cantrail water filler present, three-rung bogie mounted footsteps, ridge sided sandboxes, three-piece minature snowploughs fitted . Photograph courtesy Malcolm Lowe. 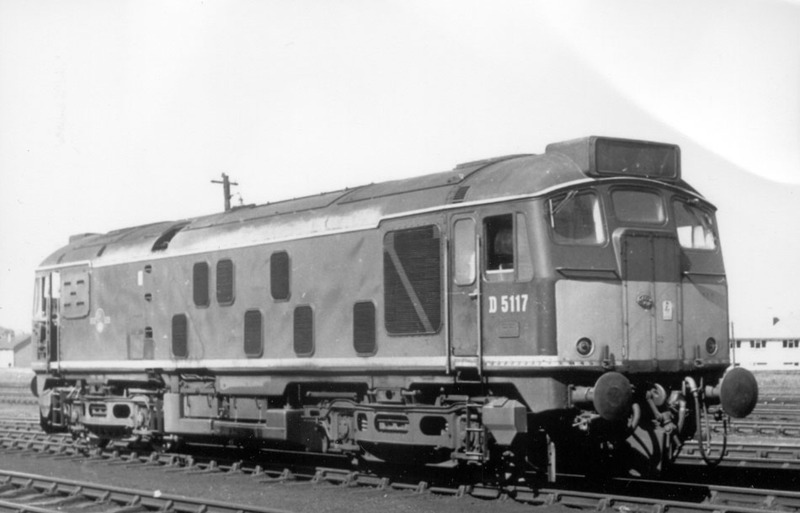 A work stained D5117 poses in the sun, possibly at Perth cicra 1966. The locomotive is now fitted with tablet catcher equipment, but still lacks headlights. The depot staff have already beefed up the weather stripping on the gangway doors. Another of the Scottish Grand Tours (No 9) ran on September 13th also with eight coaches behind 5071 & 5342 from Edinburgh to Inverness. An unscheduled stop was made at Aviemore to fill the water tank on 5071. From Inverness 5120 & 5117 made a round trip to Kyle of Lochalsh, reverting to the outbound power at Inverness for the run home over the Highland mainline. An SRPS special on June 19th encountered difficulties whilst returning from Inverness. 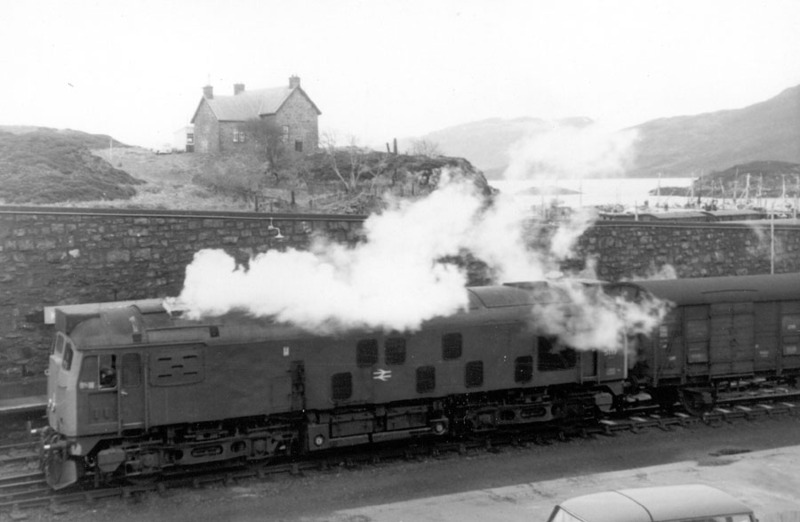 The train had been worked up from Glasgow by 5360 & 5372, and these were used for the return. Unfortunately 5372 failed leaving Dalwhinnie, stalwart 5360 soldiered on alone over Drumochter only to expire at Dalguise. Rescue came from 5117 & 5121, fresh off the “Royal Highlander’, pushing the train to Dunkeld, where further assistance appeared in the unlikely shape of 415, a class only recently cleared over this route. Travelers on the special finally reached Glasgow 160 minutes late. Condition August: blue/yellow livery, gangway doors fitted with substantial weatherstripping, full size water tank, shortened fuel tank, tablet catcher equipped, blanking plate fitted (five slates), hand/footsteps plated over, cantrail water filler sheeted over, three-rung bogie mounted footsteps, ridge sided sandboxes, one ventilator grille sheeted over (3rd right lower row from radiator panel, non BIS side), 'D' prefix present, three-piece minature snowploughs fitted . Photograph courtesy Tony Sayer. 5117 having arrived at Kyle with a parcels train from Inverness, August 9th 1972. Photograph courtesy Tony Sayer. Kyle of Lochalsh on August 9th 1972 with an interesting elevated view of 5117 as it shunts the yard, prior to working a service back to Inverness. The locomotive sports a number of the Glasgow modifications unique to the Inverness allocated locomotives. 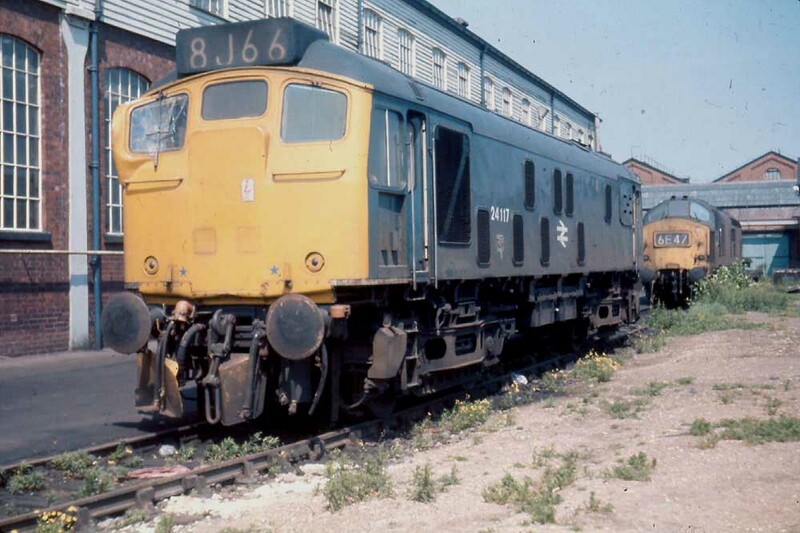 The now redundant tablet catcher recess was never plated over on the Class 24s unlike some examples of the Eastfield allocated Class 25s that did lose the recesses on visits to Derby. Condition June: blue/yellow livery, gangway doors sheeted over, headlights fitted, no minature snowploughs, shortened fuel tank, full size water tank, boths tanks fitted with circular gauges, blanking plates fitted (five slats), hand/footholds plated over, cantrail water filler sheeted over, three-rung bogie mounted footsteps, ridge sided sandboxes, weatherproofed headcode box glazing, small BR emblem on bodyside. Photograph collection of webmaster. Nine months later at almost the same spot the boiler of 5117 adds to the plentiful supply of Scotch mist at Kyle of Lochalsh on April 7th 1973. The locomotive still carries its two sealed beam headlights but has lost its tablet catcher. The fuel and water tanks have gained the circular gauges. On June 4th 5117 was derailed all wheels at Thurso, at least one wagon was also derailed. Severe weather conditions on the night of April 7th impacted services in the Highlands. The 23.20 Glasgow Queen Street - Inverness was delayed about an hour due to snow clearance at Druimuachdar Pass. The 06.15 Inverness - Wick/Thurso with 24116 was halted at Rogart due to fallen telegraph poles. A bus service was established between Rogart and Brora. The southbound bus brought Inverness bound passengers into Rogart where 24116 and a Class 26 headed south. Northbound passengers encountered a four late arrival in Wick & Thurso. A southbound working with 24127 ran out of fuel at Tain, with 40125 sent from Invergordon to assist. On May 17th an Open Day at Glasgow Works included 24117 & 24121 receiving attention. A long distance LNER Society trip to Wick/Thurso over September 12th – 14th ran from Mossend to Inverness behind 26037 & 26043, Inverness to Wick behind 24117 & 24126, the Thurso branch handled by 24112. On returning to Inverness 24125 & 24127 were waiting for the run to Perth, allowing 40164 the short hop to Mossend for an electric back to London. This was most likely the last significant railtour to utilise Class 24s north of Inverness because during October they were transfered to Haymarket in exchange for Class 26s. At this time their headlights were removed. 24117 was placed into unserviceable store on January 9th, no doubt due to the collision damage sustained to the 2nd man's side of the No.1 cab. Condition final: blue/yellow livery, gangway doors sheeted over, headlight location sheeted over with square plates, three-piece minature snowploughs, shortened fuel and water tanks, boths tanks were fitted with circular gauges, blanking plates fitted (five slats), hand/footholds plated over, cantrail water filler sheeted over, three-rung bogie mounted footsteps, ridge sided sandboxes, weatherproofed headcode box glazing. Page added July 29th 2016. Last updated February 24th 2019.